Applying Recent Copyright Court Decisions to Distance Ed. Fair use, transformative uses, and copyright compliance are important concepts to understand when selecting materials for online courses. 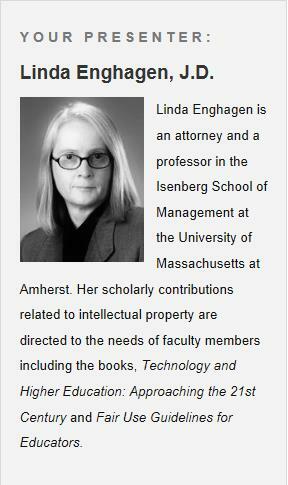 Attorney and award winning educator Linda Enghagen J.D., will share her insight on copyright and related issues. This interactive online seminar will be held Thursday, October 17, at 2pm in POY 234. A wide variety of topics will be covered, including public domain works, personal copies, library resources, textbooks, creative commons and open access resources. Learn how transformative uses apply to course materials and differentiate between materials that can and cannot be distributed legally for distance education purposes. No registration needed, simply join us for the event. We hope to see you there!